A Bond villain’s den, a cocoon in the clouds, a crystal palace: the architecture of Mashpi Lodge has been variously described according to the imagination of the beholder. 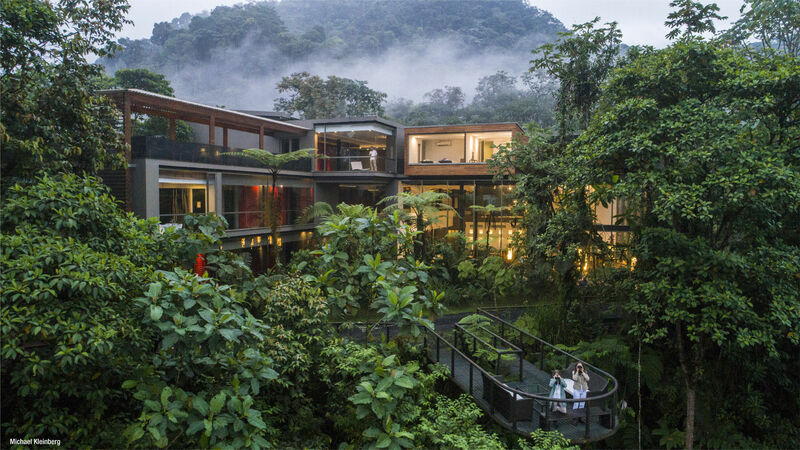 What all can agree on is the surprise and delight to find a futuristic glass structure in the middle of the wild, steaming green of the Ecuadorian cloud forest, miles from civilization. Doubly impressive is that the space is functional, comfortable, and crucially, sustainable. 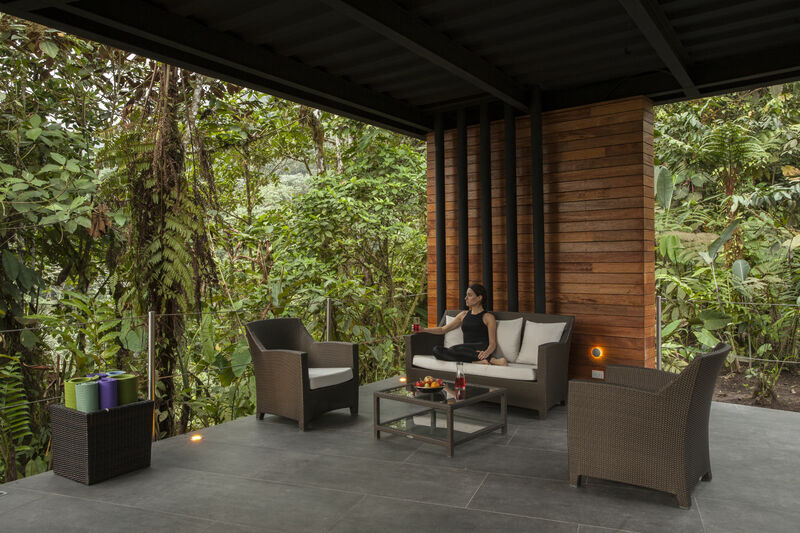 This year, the hotel that was named South America’s Leading Green Hotel in the World Travel Awards 2017 has evolved again, completing interior renovations and the construction of an entirely new space that will alter and expand the identity and potential of the jungle lodge while continuing its conservationist philosophy. The most ambitious of these add-ons was SAMAY, a 125-square-metre structure set 20 metres back from the hotel with an outdoor covered hot tub, a yoga deck, and two massage rooms, envisioned to turn Mashpi into a relaxation destination. “For a long time, we have seen the jungle lodge as a place for expeditions, discovering nature, and adventure,” explains Marc Bery, the hotel’s general manager. The task of designing the building fell to seasoned architect Roberto Burneo, who, with more than a quarter of a century of experience around the planet under his belt, had already created a space – the semi-circled, wooden-decked Life Centre – for the jungle lodge. He settled on a metal structure using a pre-assembled system of metal framing. This allowed for minimal impact on the environment, calling for very little cement, which could be mixed on site. Trellises and covers made of engineered, laminated wood visually integrated the building into the forest. Although aesthetically similar to the ultra-modern hotel, where the main building has floor-to-ceiling glass windows, SAMAY has none, removing all barriers to nature while allowing guests to feel protected by the structure. “Building the space open, you have a constant cross ventilation. This allows you to not use air-conditioning and save energy,” says Burneo. Julio Vinueza, the Miami and Sorbonne University-trained interior designer behind both the original interiors of Mashpi and the recent renovations, was at first intrigued by the instruction of the jungle lodge’s owner, Roque Sevilla, to leave nature out of the design. The former mayor of Quito explained to Vinueza that, as guests spend their whole day outside in wild surroundings, it was important for them to come back to a safe haven where everything could be controlled, from the temperature to the technology and sounds around. The next element of the new conceptualization was to turn the minimal, modern space into a comfortable and cosy den where guests could relax not only after a long day of expeditions, but all day, if they chose. A new Expedition Room with honesty bar and a family room were brought into the design. “We wanted to create more sitting spaces throughout the hotel. Not necessarily a place where you need to interact with everybody or other guests, but you could also have places where you can interact with small groups, more private spaces as well, spaces where you don’t have to be in a group all the time,” Vinueza explains. The designer brought in rugs and vintage-inspired sofas, lighting for reading, soft fabrics and magazines inviting guests to take a seat a browse. Vinueza estimates that around 95% of all the new furniture and fittings were manufactured locally, a core element in all his designs. 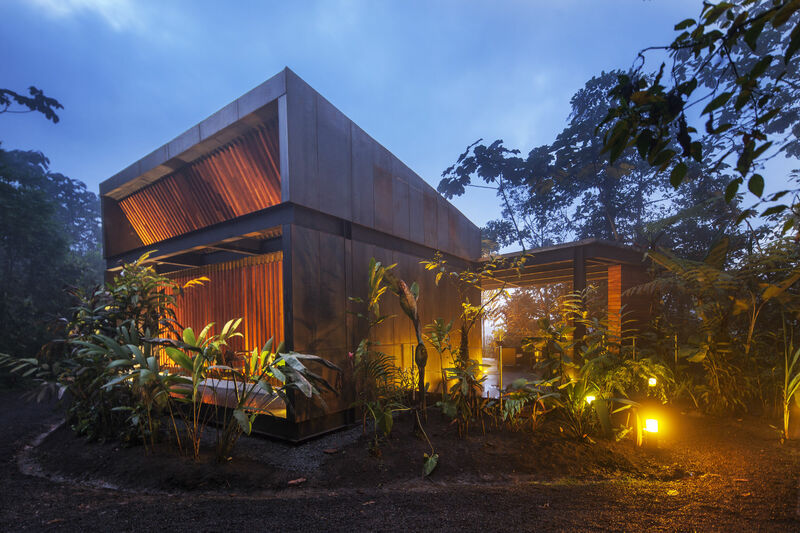 Together, the two heavyweight designers have created spaces that manage to blend into the surroundings, while acknowledging the alien nature of this unique jungle lodge in the middle of the cloud forest. 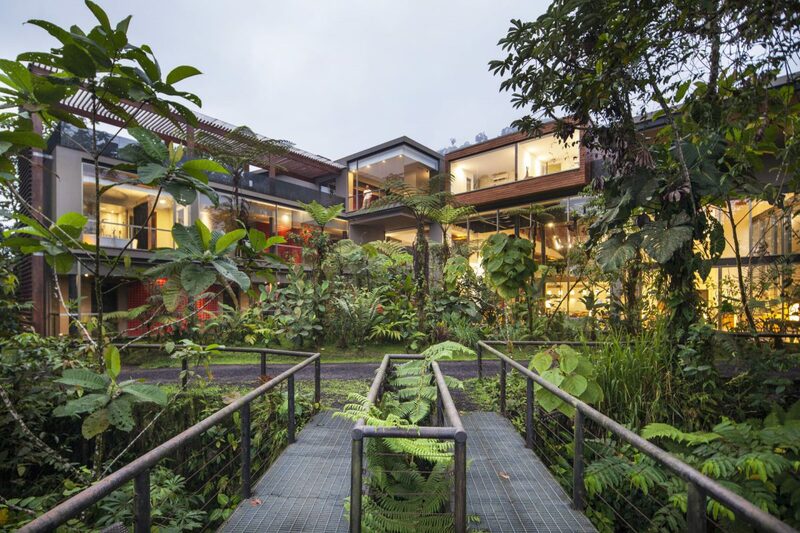 But what both he and Vinueza have achieved gets as close to that as possible, leading the way in green design and setting the bar for jungle lodges world over. Why is Mashpi Lodge the perfect place to celebrate romantic occasions? How much does it cost to go to Mashpi Lodge and why? What type of guides are there at Mashpi? What’s so special about the Mashpi Reserve’s location? What is the Mashpi Torrenteer Frog and how was it discovered?